Once a storage solution used only by enterprise datacentre's, RAID (or Redundant Array of Independent Disks) has slowly been gaining ground in the enthusiast market over the past few years. Starting with the introduction of Intel's "Matrix" RAID on their ICH6R Southbridge chipset along with many motherboard manufacturers including chipsets from manufacturers such as Highpoint and Marvell, the ability to create basic RAID0/1 arrays on most mid to high-end motherboards has been available to us for some time. However, while most of these solutions have undoubtedly got the job done, most are nothing more than a firmware based implementation of RAID, offering little more than the most basic of functions and relying on system resources and drivers in order to work correctly. Enter Adaptec. Probably one of the oldest (if not THE oldest) manufacturers' in the storage I/O industry. Adaptec are well known for their production of high-end server grade SCSI, IDE and more recently, SAS/SATA controller cards. Today we've been given the opportunity to test one of the latter in the form of their "RAID 2405 "SAS/SATA controller. For those of us who haven't come across the acronym SAS before, it stands for Serial Attached SCSI which is in effect the latest edition of the SCSI standard. However, whereas previous SCSI technology has relied upon its own unique parallel based interface, SAS uses connectors that are interchangeable with the widely used SATA standard and thus both SAS and SATA based hard disks can operate on the 2405 controller. Marketed as an entry level RAID controller, the 2405 still manages to pack quite a feature set. As we can see from the specs below, Adaptec have fitted the card with an 800MHz processor, 128MB of DDR2 memory and an 8x electrical (4x physical) bus interface. This should certainly ensure that the performance of attached storage devices is not bottlenecked while also reducing the workload of the PC / Server's main CPU significantly. The Series 2 family of Adaptec Unified Serial™ (SATA/SAS) RAID controllers leverages the same industry-leading dual-core hardware RAID design as our industry-leading Series 5 Performance RAID controllers. The Adaptec RAID 2405 features 800 MHz of processing power, a 128MB of DDR2 write cache, connectivity with the latest x8 PCI-Express, and direct I/O connectivity for SATA/SAS tape devices and hard drives. Using SAS expanders, it supports up to 128 devices. The Adaptec RAID 2405 supports a wide range of operating systems, compatibility with more than 300 third-party devices, and full integration with Adaptec Storage Manager™ for centralised management of all Adaptec RAID controllers on the network. The power required by disks is a primary ongoing storage cost. Full power is maintained to every disk whether it is actively being used or not, which also increases cooling costs. Adaptec Intelligent Power Management slashes power and cooling costs by spinning down idle disks and providing a lower power mode for active disks. With native support for four hard disks and the ability to connect up to 128 hard disks using SAS expanders, the 2405 also has more than enough capacity to replace the role of any motherboard-based SATA RAID controller. It's almost impossible to imagine 128 devices spanning off a single card, but we're sure there are some storage hungry admins out there who would be keen to show us pics. Another great feature of the 2405 is that it supports just about every operating system known to man. From Windows XP and Vista 32bit /64-Bit, to Linux distro's such as Redhat and SUSE, FreeBSD, Sun Solaris and even VMWare. For those interested in building their own "Hackintoshes" we've also heard reports of the card being supported under OSX....but we didn't say that! Why you don't mention missing RAID 5 (6) as "BAD". My opinion, it is very bad. The second thing that was more then surprising is 2 HDD configuration. Dedicated Hardware RAID controllers may perform on the same level (or even worse) as software assisted with 1 disk attached. With 4 disks you can get 300+ MBps read write. Once, during my work in HP IT department i had an opportunity to play with few RAID setups and found that dedicated hardware controllers begin significantly outperform software assisted controllers like onboard controllers on almost any M/B when used in RAID 5 or 10 setups in system under load. It worse nothing to compare them like you did. Try to ran on top of your OS DB + Web serving 500+ connections per minute at least + ran some serious CPU intensive task (like C or C++ compilation) and then you'll see what you paid for with Hardware RAID controller. But the bottom line, It is good to see that this site reviews not only i7 or HD4870 like others do. Quite true, an oversight on my part. Thanks for bringing that up. 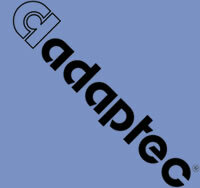 Unfortunately two hard disks was all that Adaptec provided us with for the review. Not surprising either considering they are close to £200 each. Quite true, SAS or 10k SATA are expensive. If you still have the adapter, try it with regular (7.2k) SATA drives.